At the end of February, a mysterious postcard was delivered to my house. It was hand-written (as I would’ve expected from a postcard) and addressed to me. Someone was telling me about her research (about what?) close to a waterside (where?) and if I believed in the feeling of déjà vu. 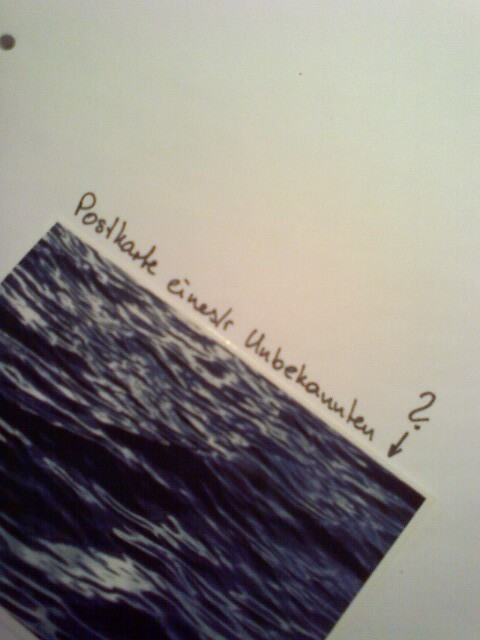 I was also asked to help the writer of the postcard (with what?) and that we would see each other at the end of the month. Signed…see, it was hard to tell because there was no signature. Not a hint of a name. Just a postcard with a beautiful shot of water, handwriting that I could not assign to anyone I know. A mystery. Naturally, I would try to solve it, so I consulted Twitter.There I would post the picture of the front of the postcard in the hope that someone else may know the meaning and purpose of this mystery mail. Most people had no idea but someone, to my surprise, someone else in my feed had received exactly the same postcard. Same text, same handwriting and lacking any kind of identification. We soon heard of someone else having received the same postcard. It dawned on us that this might be part of some viral marketing campaign, so we decided to wait for the next step. After all, the text mentioned a meeting in a month. The mysterious writer would have to contact us again in order to meet us. And they did. At least some of us. Still not sure what or who is behind all these messages a hint is posted on the Facebook wall – our first riddle! It was made clear that we need to help identify nymphs, who are living in the past as well as in the present. By solving the riddles we would receive numbers, which would lead to a final riddle that gives us the telephone number with which we can reach the nymphs and finally meet them. Needless to say, I was hooked and needed to find out what’s behind all this. Which product is advertised with this elaborate campaign and will it be a disappointment in the end or a pleasant experience all in all? Furthermore, who is pulling the strings, who is the puppet master and the game designer? A core group of riddle solvers quickly found each other who would do enormous amounts of research. Every little word, every sentence, every social platform and web 2.0 application was consulted to find the 11 numbers that would lead us to the 12th riddle and, of course, to lifting the veil of the mystery. We had to find Amazon wish lists and Flickr accounts, we had to virtually hunt for hints on Foursquare and listen to the radio, search event pages and the contents of Vienna’s inner city wells. We received glass bottles, videos, keys, egg stones, marbles and towels in return, which were sometimes more confusing than helpful. The best part, though, was finding like-minded people who were just as excited about solving the mystery as I was. Meeting them in person to solve one of the riddles was great in itself. To be more precise, to the unveiling of the film at the MQ in Vienna with great food, lots of mineral water and champagne. And – a final “riddle” that had to be solved. A sugar cube, a glass of water and we would see or not see…what? Well, most of us saw a tiny red heart emerge, one of us saw a nymph. Everyone who found a red heart in their glass would receive a season ticket for Thermalbad Vöslau, a beautiful place right outside of Vienna, where the movie was shot. The one with the nymph? Well, she has won a ticket for the fashion week in Berlin. Thank you Vöslauer, Richard Pyrker and Andreas Wochenalt for an entertaining riddle, a great marketing campaign and the season tickets to Vöslau! That sounded amazing! I was wondering what all those tweets were about recently 🙂 – I’m half-hartedly following the Portal 2 ARG that is going on at the moment (but it involves too much gaming skill in games I’m really not good at) and as always I’m amazed at how much depth these ARGs contain and how much thrill they can conjure up. It looks like you had a good time with it as well. I am so sorry about the tweets. I’ve noticed that I didn’t tweet anything else but riddle-related tweets. I also followed the Portal 2 ARG. When playing Portal I’ve started noticing scribblings on the wall that I started to Google but I never really got into it (I, too, lack the skills). But I love those ARGs and riddles. Loved the Dropquest and was super-ambitious about it. Reddit had similar (shorter) riddles as the first part of their recruiting process. Solved the riddle but had no other skills they needed ;). It’s one of the free WP themes.